One of the most sought-after achievements in the concrete industry has been a test to adequately measure the workability of the concrete. Most workability tests measure various properties of fresh concrete, but very few tests measure a useful workability property for a certain application. For example, the Slump Test has been the most specified workability test, but it measures the consistently of fresh concrete to fall under its own weight. The ability of a mixture to fall will not dramatically indicate if the mixture will be suitable for building a floor slab or bridge deck. This inability to adequately measure the workability of concrete has created much controversy over the impacts of various mixture components effecting the workability of concrete and the dependability of any workability test to measure the workability of fresh concrete. Fig. shows the Slump Test being conducted on a flowable concrete mixture. 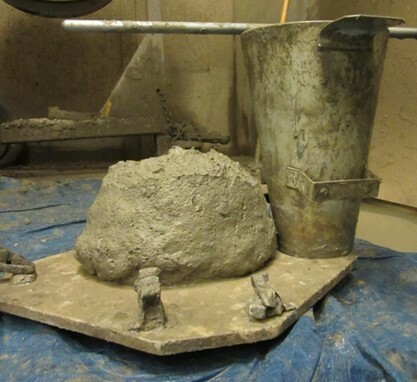 While the Slump Test has been widely used as a specification to evaluate workability, it has been commonly believed to be inadequate at measuring the workability of concrete in the field. Shilstone had this to say about the Slump Test, “The highly regarded slump test should be recognized for what it is: a measure of the ability of a given batch of concrete to sag.”. While this “sag” property of the concrete may have other uses in the quality control department, this property does not measure the ease at which a mixture can be mixed, placed, consolidated, or surface finished. Other tests are needed to measure the workability of concrete. Since meaningful workability tests have not be developed, contractors use visual observations to evaluate the workability of a concrete mixture. The observations can be conducted by watching the concrete flow down a concrete chute, dragging the concrete with a come-along, or using a float to smooth the surface of the concrete to evaluate the surface finishability. These tasks require a mixture to obtain certain behavior characteristics such as a certain stiffness, flow, cohesiveness, richness, and surface finishability. While stiffness describes the resistance of concrete to movement, flow describes the ability of the concrete to continuously move. Also, richness describes the amount of sand and paste in the mixture for proper workability. Mixture with poor richness may struggle to meet the desired workability requirements. Another behavior important behavior of concrete is the cohesiveness of the mixture to be homogenous and not segregate. This can have a dramatic impact on stiffness, flow, and surface finishability. A very common way to float the surface of the concrete has been to use a bull-float for removing surface voids and creating a smoother surface texture. This involves a flat rectangular piece of metal that glides over the surface of the concrete to fill in voids, remove texture, and further level the surface. Multiple passes can be required to glide over the surface of the concrete to achieve the desired surface finish. If a large number of passes was required to achieve the desired surface finish, the mixture had a poor ability to be surface finished. This number of passes required to fill in the surface voids and smooth the concrete surface can measure the ability of a mixture to be surface finished. A.) Static Yield Stress- The minimum stress to initiate flow. Ø What is the difficulty of dragging concrete with a come-along? Ø Will this mixture instantly clog the concrete pump? Ø Will the concrete leave the mixing drum? B.) Dynamic Yield Stress- The minimum stress to maintain a constant flow. Ø How hard does the pump have to work to keep the flow constant? Ø Will the concrete get stuck in the chute? C.) Plastic Viscosity- The ability to resist flow. Ø How fast does the concrete flow in the pipe of the pump? Ø How fast does the concrete flow down the chute?